Who are your single mum role models? One of mine is Lorelai Gilmore. While fictional TV characters aren’t normally my go-to source of parenting advice, as a single mum surrounded by couples, I’ll take my single mum role models wherever I find them. Let’s face it, positive representations of single mums aren’t exactly plentiful in our culture. So I do a little happy dance when come across a someone, real or otherwise, that sheds a positive light on single parenting. Because Lorelai doesn’t just survive, she thrives. And she does it while talking ten to the dozen, building her own business and balancing plates on her head (actually I made up that last part). I’m referring to the lead character in the US TV series Gilmore Girls – recently revived, rather unsuccessfully, on Netflix. In the pit of my recent existential crisis I felt so depressed I struggled to move from the couch for the most of the day. OK, I managed to do the school run, but beyond that I was hopeless. My couch hours were spent eating Tunnock’s Teacakes and watching all seven series of the show, almost back to back. Now I’ve watched it all, and fallen in love with Stars Hollow, I can’t believe the show started in 2000 and it took me 16 years to discover it. As those of you who are a bit quicker on the uptake will already know, Gilmore Girls is about fiercely independent and enviably quick-witted single mum, Lorelai and her daughter Rory. It’s also about and the relationship they have with Lorelai’s parents, Emily and Richard Gilmore, and the various love interests in their lives. Within a few of episodes I was hooked. Assisted by the rather indecent crush I developed on Milo Ventimiglia. But I digress. I’ve always longed to live in a community like Stars Hollow. Lorelai and Rory know all their neighbours, hang out at their local cafe and take part in all the cringeworthy community activities (24 hour dance-a-thon anyone!?). Everyone knows them, loves them and takes care of them, from their neighbour Babette and the totally unhinged Kirk, to Miss Patty who runs the dance school and the long-suffering diner owner, Luke. Where I grew up, and now live, community spirit is conspicuous by its absence. I vaguely know my next door neighbours and a couple of families who live in my street, but there’s no hub of the community where people congregate or mingle, and I miss that. I’ve loved it when I’ve lived in places where there’s been that sense of feeling part of the fabric of a place. I first experienced it at university and it’s a big reason why I fell in love with Australia. As I watched the show I realised that while I don’t miss the sun and beaches of Sydney nearly as much as I thought I would, I do miss the sense of belonging that we had there. In Sydney I became close friends with my upstairs neighbour, knew everyone in my building, and all the children in the street used to go tricky-or-treating and on Easter egg hunts together. We had street BBQs on the weekends, all the shop keepers round the corner knew us and I even had a Lorelai-style flirtation with the guy who served me coffee. It added a richness to life, and reduced the loneliness which can be a reality for many single parents. Feeling isolated can contribute to depression and feeling like you can’t cope, so finding a community you and your child feel supported by is worth striving towards. This is one I struggle with, and is probably the hardest to follow through on, particularly with a teenager. Being a single mum of a small child you quickly realise that unless you want to hear yourself yelling 24-7 you have to start picking your parenting battles wisely. When you’re on your own there’s no-one to play good cop to your bad cop, or to pick up the slack, so I try not to sweat the small stuff. Otherwise you’d rarely have any fun. But with a teenager the stakes are higher. Rory doesn’t always do what Lorelai approves of – dating smokin’ hot bad boy Jess (Milo Ventimiglia – swoon!) for one – but Lorelai knows when to take a step back and let Rory make her own mistakes. While she wants to lay down the law, the approach her own parents took, she realises that approach will wreck her close relationship with Rory. Decide what really matters and what doesn’t and let some of the small stuff slide – you, and your child, will be happier for it. Lorelai let’s Rory make her own mistakes. As I touched on above, instead of stopping her seeing Jess, Lorelai tells Rory she trusts her judgement. Yes Rory ends up getting her heart broken, but she learns a valuable lesson from that experience and next time Jess comes into her life she knows to steer clear. Most importantly, the lines of communication remain open with her mum – she knows she can turn to her for advice and support. I’d much rather Miss E trusted me enough to come to me when she’s in trouble then hid it from me because she was afraid of my reaction. Even when Rory drops out of college, risking all she’s worked for, and goes to live with her grandparents, Lorelai lets her learn for herself that she’s made a big mistake. At one point Lorelai says she and Rory are best friends first, mother and daughter second. To be honest I think you always have to be mother first, but if you try to treat your child with the kind of respect you would a best friend you’ll reap the rewards. Trust your child and you’ll earn their trust in return. Being a single mum it’s easy to neglect the part of yourself that needs and wants romantic companionship and love. It’s not easy to get out, babysitters cost a fortune and anyway, who has the time? Maybe it’s my fiercely independent streak, or maybe because I’ve been let down too much in the past, but I find it hard to admit I’d like to share my life with someone. It feels like admitting weakness. But it’s just human. We’re social creatures who aren’t meant to be alone. Through seven series of the show Lorelai never gives up on love. She dates, she falls in love, she gets marries, she gets divorced. After every knock-down she gets back up again. Just because relationships haven’t worked out in the past doesn’t mean they won’t in the future. Lorelai doesn’t let anything stop her from following her dreams. She works her way up to become manager of the Independence Inn, graduates from business school and then opens her own inn. She doesn’t let her parents expectations stop her, or anyone else’s, and certainly doesn’t let being a single mum stop her from starting her own business. She follows her dream and sets a great example for her daughter. Know what you want and go after it. The path you take towards it may not be what you expect, you might have to take a few detours, but if you stay focussed on where you want go you’ll get there in the end. Fiercely independent Lorelai starts out wanting to prove she can stand on her own two feet without the help of her wealthy parents. I understand where that comes from. I call it my ‘I made my bed so now I have to lie in it’ mentality. But Lorelai realises that it’s not in her best interests, or Rory’s, to stay so stubbornly independent. In the very first episode she asks her parents to help her pay for Rory’s school fees. It sticks in her throat to go to them, but she does. She makes sure her daughter knows there’s other people around her she can trust, other people aside from her who will look out for her best interests. Being a single mum doesn’t mean you have to cope alone. You, and your child, need to trust and rely on others. Swallow your pride and let people around you help. YES! 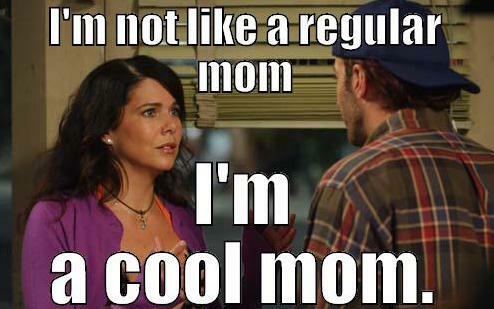 I must confess to a huge girl-crush on Lorelai. Brilliant insights here, thank you.